As a starting point to their careers at USD, students are introduced to the integrative nature of learning through courses in the Learning Communities (LC) program. Living Learning Communities (LLC) and Transfer Learning Communities (TLC) are parallel programs that allow students to be able to satisfy the Core requirement for first-year integration. Students are expected to recognize that people bring different perspectives to scholarly inquiry, discuss how real-world problem solving is inherently integrated and describe the value of multiple perspectives to scholarly inquiry and/or problem solving. LLC themes: Advocate, Collaborate, Cultivate, Illuminate (Honors), Innovate | TLC theme: Engage. Emphasis is placed on how to recognize broad connections between classes and articulate how different disciplines approach problem-solving related to their LC theme. Two major academic events are designed to help students achieve initial benchmarks of integration: Open Classrooms and Integration Showcases. In your first semester, Learning Community faculty members provide class examples connecting their course to their LC theme (e.g., how do Natural Disasters connect to Advocate/Social Justice?). All students attend an Open Classroom where you are exposed to a second discipline from the same LC theme. You practice recognizing and articulating these connections and contexts. You are then asked to self-reflect on how your own understanding might be enhanced by thinking about a big picture question from more than one perspective by completing an Open Classroom Reflection assignment (See example of Open Classroom Reflection assignment). Dr. Beth O'Shea teaches EOSC 110 - Introduction to Geosciences in the Advocate theme, looking at issue from a perspective of social justice. 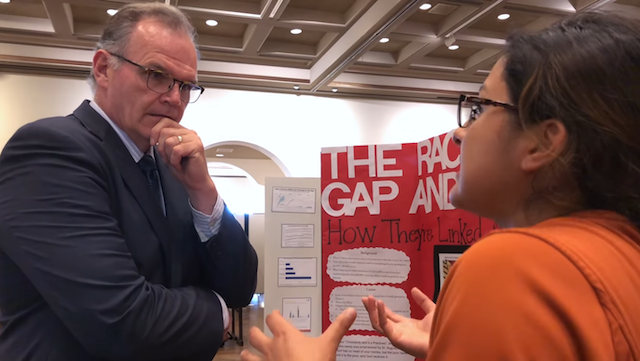 Watch Dr. O'Shea's open classroom presentation below entitled, "ROCKS: The foundation for immigration, a reason for your IQ and other really obvious connections." After a full semester practicing, recognizing and articulating integration, you to continue to look through the lens of the same LC theme while focusing on the discipline of your spring LLC course. You now have two courses or disciplines by which to connect to your LC theme and are prompted to demonstrate these connections through an assignment presented at the end of the first year LC experience at the Integration Showcase. Transfer students undergo a similar experience which is completed in one semester instead of two (see video footage of the TLC Showcase).